Growing Knockout Roses in containers is an easy, low maintenance way to enjoy rose gardening. These shrub roses are proof that anyone can be a rose gardener – even me. They are hardy and disease resistant and the perfect size for container gardening. Knockout roses grow 3-4 feet tall and wide, and require little pruning to keep their mounded shape. They have lots of blooms and will keep flowering up until fall with a little care. Fill the pot with about half of your potting soil and set the root ball in it. Loosen the roots and spread them around a little and then add the rest of your soil. Don’t cover the crown of the rose – leave it just above soil level. (The crown is the point where the stems start to branch out from the main root ball). Add an inch of so of mulch, once again keeping the crown uncovered. Fill the pot to about an inch from the top of its rim so you can water it without worrying about overflow. 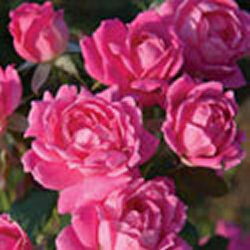 Try to plant the rose so that it is at about the same height in your pot as it was in its nursery container. Water thoroughly and place in an area that gets at least six hours of sunlight per day. Container roses can be planted at any time during the year, but I advise planting Knockout roses in containers in the spring. This gives the shrub a chance to get well established through the warm months before it goes dormant in winter. 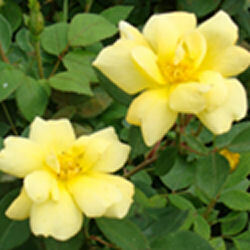 Knockout roses are heavy feeders so they like lots of organic material in their soil. Use a soil mix that includes one part good potting soil and one part organic compost. Many gardeners also add some bone meal to their soil mix to encourage root growth. Potting mixes designed for rose growing can also be purchased. After the rose has bloomed once, start fertilizing. 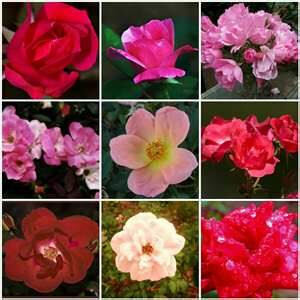 Use a water soluble rose fertilizer once a month throughout the growing season. Water your Knockout roses in containers regularly. When you water, water down into the pot – not on the foliage. This helps prevent black spot on the leaves. Dead-head the spent blooms by clipping to encourage blooming and trim stray branches as needed to keep a mounded shape to the rose. 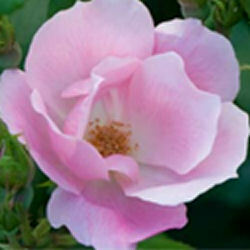 Prune Knockout roses in late winter or early spring while the shrub is dormant. I screwed this up on my first Knockout rose and it didnt bloom as well as it could have. I also hesitated to prune it as much as it needed. Now, I cut mine back to about 12 inches in very early spring while they are still dormant. The rose will bloom from the new growth that results. Cut just above a spot where a bud will form and cut at a downward slant. The highest part of the cut should be toward the outside of the plant and the lowest part of the slant should be to the inside. Knockout roses in containers can’t survive outdoors in temperatures that go to freezing and below. Move them to your unheated garage or garden shed where they will be protected during the dormant period. Once the threat of frost has completely passed, you can bring them back outdoors. If you think the roses need more protection than what your garage or shed can provide, wrap some burlap around them. Don’t prune your Knockout roses back before you overwinter them. Leave them alone and prune them back in late winter or early spring. They bloom off of new growth. Here’s a container garden that is inspired by a classic plant combination – roses and herbs. 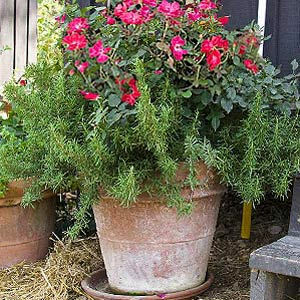 From P Allen Smith, this Knockout rose is planted with rosemary. They both like full sun, regular watering and good drainage. The rosemary trails over the sides of the container and makes a pretty evergreen accent for the brilliant colors of the rose.